This article is part of a series, now called the “Herb of the Month”, where we explore the culinary and health benefits of herbs. Last month we got in on thyme. This month, parsley is our showcased herb. A delightful herb with more beneficial nutrients than even kale, but which is all too often swept aside as nothing more than decoration. I became interested in learning more about herbs a couple of years ago when the Portland Nursery held a summer-long series of cooking classes. We were treated to wit and wisdom from one of the Oregon Culinary Institute’s most knowledgeable teachers, a well-respected chef, and well-known gardener: Daniel Brophy. He always said that to truly know an herb, one should try it for a month in as many ways as possible – from tea to truffles. He called this practice “The herb of the month” and I hope this series helps keep his memory alive and well. “So, what makes parsley unique?”, you might ask. Like a good supporting actor in your favorite film, you probably already know that herbs provide a wonderful supporting role to great cooking. They might not be the main attraction, but without them, your guests and customers can be left feeling a little empty. Parsley in all its curly and flat varieties is one of the most versatile of the fresh herbs to grace food. This pretty little Mediterranean herb lends a sprinkling of color to your plate. And what would tabbouleh be without parsley? Mixed with tomatoes, couscous, a squeeze of lemon, garlic, and green onions, the bright flavor and vibrant green color is a favorite Mediterranean dish. We will dive more deeply into using parsley for culinary purposes, but as like most herbs parsley also has great health benefits. A little on its health benefits are included toward the end of this article. According to the Huffington Post, parsley is considered to be the world’s most popular herb. It derives its name from the Greek word meaning “rock celery” (parsley is a relative to celery). Native to the Mediterranean region of Southern Europe, parsley has been cultivated for more than 2,000 years and was first used medicinally before finding its way into Greek and Roman cuisines where it was used as a garnish. Considered to be sacred, parsley was used for adorning the victors of athletic contests as well as for decorating the tombs of the deceased. While it is uncertain when parsley began to be consumed as a seasoning, it seems to be sometime in the Middle Ages in Europe. Some historians credit Charlemagne with its popularization since he had it grown on his estates. There are two dominant types of parsley, curly parsley and flat-leaf or Italian parsley. In most countries the curly leaf variety is more popular. This may have its roots in the fact that people were often reticent to consume the flat-leaf (Italian) variety because it resembled a poisonous weed called fool’s parsley. A relatively new species called Turnip-rooted (or Hamburg) parsley has started gaining popularity within the past two hundred years. This humble herb packs so much flavor that it wakes up any dish. While mint or dill may overpower, parsley never steals the limelight. When you’re buying parsley, the first step is establishing whether your need curly- or flat-leaf parsley. Many restaurants use Italian parsley because the leaves are flat and easier to wash. While the curly version is often thought to have a stronger green taste and just used as a garnish, it can actually be quite flavorful. Flavor is often due to how and where the herbs are grown. If following a recipe, it is always good to go with the recommended variety, since they perform very differently. Before buying one or the other, use the smell test to see which variety is more potent in your grocery store or farmers market. As a general rule of thumb, the flat-leaf is great for salads and sauces. And Bon Appetit suggests using curly leaf parsley in tabbouleh and in a bouquet garni to season stock. Personally, my smoothies aren’t complete without a handful of chopped curly parsley added. When buying Italian or flat leaf parsley, make sure it is parsley, not cilantro. They look similar but have very different fragrances. Flat leaf parsley is firmer to the touch than cilantro and has pointier leaves. Whenever possible, choose fresh parsley over the dried form of the herb since it is superior in flavor. Choose fresh parsley that is deep green in color and looks fresh and crisp. Avoid bunches that have leaves that are wilted or yellow, as this indicates that they are either overly mature or damaged. Just like with other dried herbs, if you choose to purchase dried parsley flakes, try to select organically grown parsley since this will give you more assurance that the herbs have not been irradiated. Fresh parsley should be kept in the refrigerator in a plastic bag. If the parsley is slightly wilted, either sprinkle it lightly with some water or wash it without completely drying it before storing in the refrigerator. If you have excess flat leaf parsley, you can easily dry it by laying it out in a single layer on a clean kitchen cloth. Once dried, it should be kept in a tightly sealed container in a cool, dark and dry place. 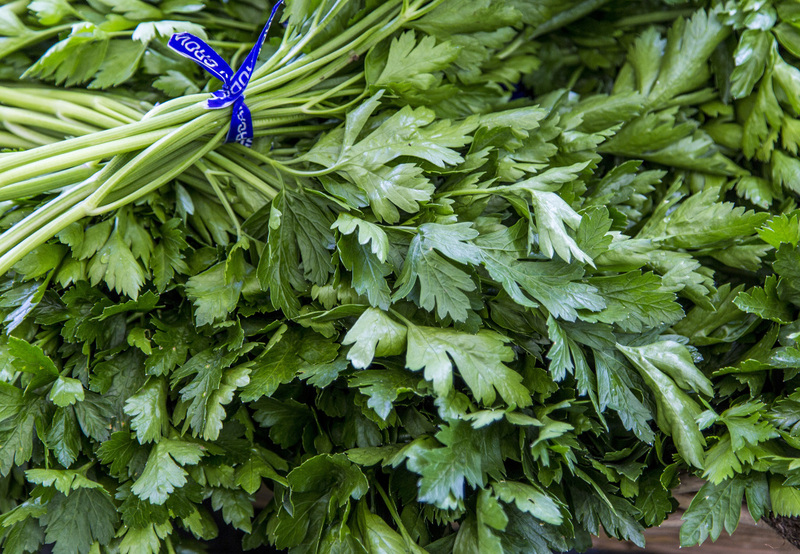 Curly-leaf parsley is best preserved by freezing, as opposed to drying. Although it will retain most of its flavor, tends to lose its crispness, so it is best used in recipes without first thawing. Fresh parsley should be washed right before using since it is highly fragile. It is best to clean it just like you would spinach. Place it in a bowl of cold water and swish it around with your hands. This will allow any sand or dirt to dislodge. Remove the leaves from the water, empty the bowl, refill it with clean water and repeat this process until no dirt remains in the water. The curly and flat-leafed varieties of parsley have a green, almost lemony flavor. Parsley perks up salads and vegetable dishes without stealing the show or overpowering other flavors. It also stays fresh-tasting even after sitting out on a buffet table for several hours. Since it has a stronger flavor than the curled variety, Italian flat leaf parsley holds up better to cooking and therefore is usually the type preferred for hot dishes. It should be added towards the end of the cooking process so that it can best retain its taste, color and nutritional value. When making a light- colored sauce, use the stems from this variety as opposed to the leaves, so the sauce will take on the flavor of parsley but will not be imparted with its green color. Its leaves are less tender than its cousin chervil, and the stems can be woody. Generally, use only the leaves in your fresh preparations, chopping them finely before adding them in. The stems still have a lot of flavor, so save them for use in a bouquet garni and use for flavoring soups and stock or a pot of beans. Combine chopped parsley with bulgur wheat, chopped green onions (scallions), mint leaves, lemon juice and olive oil to make the classic Middle Eastern dish, tabbouleh. Add parsley to pesto sauce to add more texture to its green color. Combine chopped parsley, garlic and lemon zest, and use it as a rub for chicken, lamb and beef or in a salad dressing. Finish off an omelet, quiche, or frittata with a handful of chopped parsley. Add chopped parsley to any homemade salad dressing. Use parsley in soups and tomato sauces. Serve a colorful salad of fennel, orange, cherry tomatoes, pumpkin seeds and parsley leaves. Chopped parsley can be sprinkled on a host of different recipes, including salads, vegetable sautés and grilled fish. Use it in a smoothie with other green vegetables for a super boost of energy. Visit Taste of Home for more excellent recipes. In addition to adding a unique flavor to whatever it is added to, parsley boasts some well-documented health benefits. Yes, that leafy garnish that sits on the side of your plate — the one that is thrown away after you eat the rest of your meal — is a quiet superfood, so packed with nutrients that even that one sprig can go a long way toward meeting your daily requirement for vitamin K. Many people think that Kale has the highest levels of calcium and vitamin K. But it pales in comparison to parsley. Nutrition Booster – The vitamin K in parsley aids in bone health, while the wealth of vitamin C makes it a great immune booster. Parsley is an excellent source of beta-carotene, an antioxidant that can help protect the body against free-radical damage and fight the effects of aging. Joint Pain Alleviator – Parsley has anti-inflammatory properties and is helpful in relieving joint pain when used on a daily basis. Fatigue Fighter– High in iron, sprinkling parsley on your food provides a little iron boost. Anticancer Powerhouse– Parsley is known to be rich in cancer-fighting compounds which help fight cancer in a couple of different ways: it acts as an antioxidant that destroys free radicals before they damage cells, protects DNA from damage that can lead to cancer or other diseases, and inhibits the proliferation and migration of cancer cells in the body. Parsley is suitable to grow in containers, indoors or out. It can be planted outdoors any time of the year. New plants will need some protection from December through February. Seeds can be started indoors any time of year, outdoors late March till mid-September. Stoneboat Farm and Gales Meadow Farm at the Hollywood Farmer Market will often have parsley available, but if you prefer to grow your own, here are some tips. Use curly parsley to add fresh green color and frilly texture to a vegetable garden or as an edible edging around a garden bed or landscape. Parsley is a biannual or annual depending on the weather and can last for between one and two years. It grows in the Northwest from spring until freezing weather. In milder climates, it is frost-proof and lives through winter. The second spring after planting, the plant blooms, goes to seed, and then finally gives out. When you see it send up a flower stalk, it’s time to yank the plant because at this point the leaves will taste bitter. Growing up to a foot high, parsley is a beautiful rosette of green foliage. Because of its shape, texture, and vivid color parsley make a nice seasonal edging and provide a striking contrast to colorful annuals, like yellow pansies or bright pink petunias. It does well as a companion to annuals, perennials, and other herbs in garden beds, containers, and window boxes. Curly parsley has a more ruffled appearance than flat-leafed parsley, but both are equally lush. 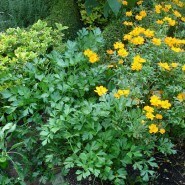 Flat Italian parsley pairs with yellow cosmos in an herb garden. Parsley doesn’t need a large yard or garden space to flourish. All you need is a sunny, warm place and containers large enough for the plants to grow with adequate root space. In fact, growing herbs in a container is great if you’re short on space, have poor soil conditions, or just want to keep your herbs close to the kitchen! Well-suited for container growing, parsley is a low–maintenance herb that is easy to grow and harvest. Parsley does well in full sun (at least 6 hours of direct sunlight), but can tolerate partial shade (3-4 hours of sunlight), and it grows best when the soil is kept slightly moist. The Italian flat-leafed parsley is a bit more heat tolerant than curly parsley. Pick it daily for superb freshness or keep it in a plastic container for up to 2 weeks in the refrigerator. 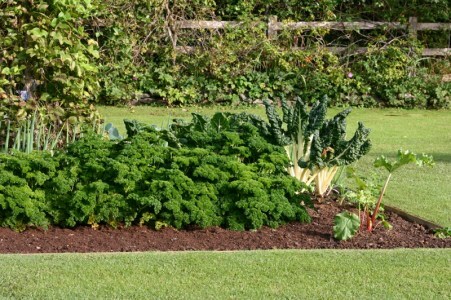 Like most herbs, parsley prefers nutrient-rich and fast-draining soil. Parsley is a moisture loving herb, but frequent watering tends to wash nutrients from the soil, however, you can replenish them with fertilizer. Whether you want to plant with other herbs in a bed, along a border, or in a container it is best if they all have the same care requirements. You can keep the roots cool and moist by mulching around the plant, but don’t cover the crown of the plant or the plant will risk getting rot. In September, promote new foliage by cutting back plants set out in the spring; this is especially true for plants grown in vegetable and herb beds strictly for their harvest. Thanks for catching up with this month’s Herb of the Month. Next month find out more about rosemary!